I noted recently that Crawford Kilian (whom I now read almost daily to give me a break from my current Workforce Planning responsibilities) stated that the Sierra Leone Ministry of Health and Sanitation had moved from an adhoc social media channel to a more developed website and it was very good. 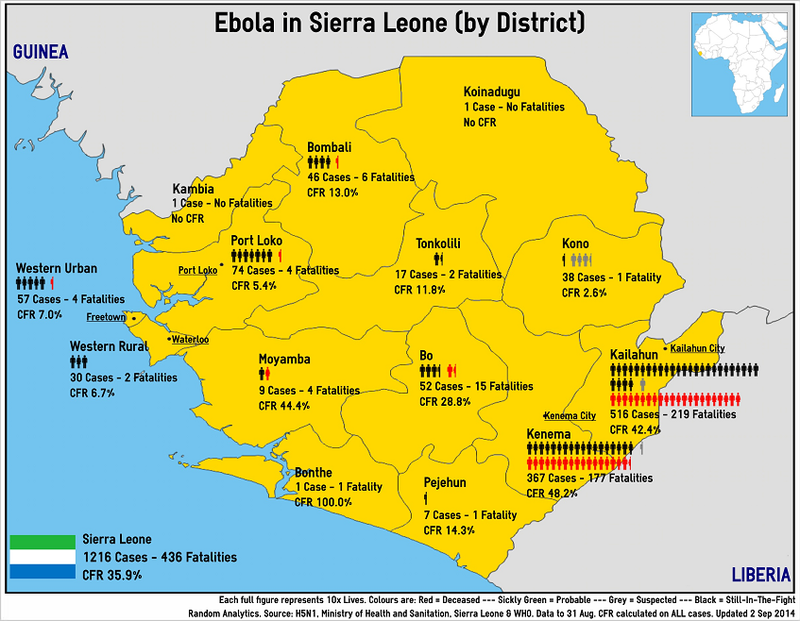 The Ministry of Health and Sanitation for the Sierra Leone Government has recently updated its Situation Report (SITREP) on the Ebola Virus Disease (EVD) to the 31st August 2014. It is recommended viewing but here is an infographic of the situation, along with a data review for the Government of Sierra Leone for consideration (the latest update comes with a data anomaly) and a couple of laymen questions. The Ebola in Sierra Leone (by District) infographic details the cases and fatalities from EVD including probable and suspected cases. Each District which is impacted by is listed with each figure representing 10x lives and then colour coded (see notes). The provisional CFR is based on total numbers and might not represent the Ministry of Health and Sanitation figures. It should be noted that the outbreak is ongoing so these numbers are still very provisional. The next is a table which highlights a very minor data anomaly (in red), which I will pass on immediately to the staff at the Ministry of Health and Sanitation. Data anomaly aside, I hope that my small intrusion into their daily (and more important work that I am currently completing) adds some value. I know that the Ministry is under huge pressure and that their work truly does matter. I’ve no problem with the data-cleansing itself anymore, outside of a small anomaly. The Sierra Leone government should be congratulated on its better presentation of the data, especially given its background story, low infrastructure prior to this new medical crisis and recent history in terms of civil war etc. The big unexplainable for me is the CFR in Port Loko which the latest update currently states is just 2.9%. Given that when I last looked at the data (to 13 August) the CFR was 12% with 25-cases there has been either an anomaly with the data or a health deployment that I am not yet across. d-maps.com. Sierra Leone / Republic of Sierra Leone: boundaries, districts, main cities. Accessed 2 September 2014. Ministry of Health and Sanitation. Ebola Virus Disease – Situation Report (Sit-Rep) – 01 September, 2014. Sierra Leone Government. Accessed 2 September 2014. Re: the Port Loko anomaly: the more newer cases there are, the lower the apparent CFR will be. This is because many of the cases currently ill will go on to die. WHO officials have said in the past that when new cases are going up faster than deaths, it usually means the outbreak is still seriously growing. So: IF a large percentage of the Port Loko cases are recent-onset cases, the interim CFR can look much lower than it will later on. “CFR” isn’t exactly the right term in an ongoing epidemic. It would be better to look at total cases / total recovered cases / total case deaths. But “CFR” is a quick short-hand that many people find easier to picture.